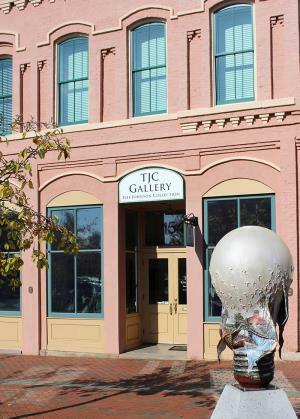 Located at 154 West Main Street in the heart of Spartanburg's downtown, TJC Gallery features rotating selections from the collection's holdings. These curated exhibitions are open to the public (including children) without charge on Wednesday, Thursday, and Friday from 12pm to 4pm as well as the first Saturday of the month from 12pm to 4pm. In addition, we are pleased to participate in the city’s ArtWalk, held on the third Thursday of each month from 5pm to 7:30pm. Any changes to the gallery's regular schedule are posted on our social media platforms. Photography (no flash) is encouraged at TJC Gallery—and please consider sharing your pictures on social media, tagging TJC as @thejohnsoncollection and using our signature hashtag: #southernart. As inviting as paintings and sculpture can be, please do not touch artwork in the gallery. The invisible dirt and oils on human hands can damage these objects. TJC Gallery is wheelchair accessible. For additional information regarding mobility and parking, please contact Holly Watters. “No man or community of men can elevate another. Curated by Dr. Leo Twiggs, Elevation from Within: The Study of Art at Historically Black Colleges and Universities pays homage to HBCU alumni and professors whose educational backgrounds chronicle a vital chapter of American history and whose aesthetic achievements have made an indelible mark on this nation’s art. Featured artists include John Biggers, Beverly Buchanan, Elizabeth Catlett, Claude Clark, William Cooper, Aaron Douglas, Eugene Grigsby, James Herring, Wadsworth Jarrell, Fred Jones, Gwendolyn Knight, Virginia Kiah, Hughie Lee-Smith, Samella Lewis, James McMillan, Robert Neal, Hayward Oubre, William Pajaud, James Porter, Arthur Rose, William Scott, Alma Thomas, Mildred Thompson, Leo Twiggs, Albert Wells, James Wells, Charles White, Ellis Wilson, Winston Wingo, and Hale Woodruff. Elevation from Within marks the second collaboration between the celebrated artist and the Johnson Collection, which sponsored the 2016-2017 tour of Twiggs’ powerful Requiem for Mother Emanuel exhibition. The current project speaks both to and of Dr. Twiggs’ own experiences. “For African Americans living in a segregated society, the sources for our creative expression came from within. Our hardships are expressed in our blues, our many moods in our jazz, and our relationship to God in our spirituals. Painting, sculpture, and dance, became a way to express all of it visually,” he stated. “My paintings always express my personal journey. It is only through the humanity of the personal that expression is elevated to the universal.” As a capstone to Elevation from Within’s presentation, Dr. Leo Twiggs will offer a gallery talk and personal reflections at this month's ArtWalk, scheduled for 6:00pm on April 18. Elevation from Within is on view through May 10, 2019.